A violinist, facing a closed arch of an emptied space, attempts to keep on his instrument a single note in unison with the noise of two operating vacuum cleaners. The man stands isolated between the oblivion and the exhausting effort to keep alive the testimony within a space that still preserves not fully decipherable traces of a previous use, elusive fragments of the past below layers of dust. The human presence is overcome by the machines which on one hand are wearily delegated to the removal of residues, the emptying of the space, on the other hand fill the environment with noise. The (only possible) action performed by the human is the attempt to attune to the buzz that surrounds him. This work is a reflection on memory, its condition of solitude and the processes of its establishment and decay. Alessandro Fonte (IT), born 1984. He has a multidisciplinary formation ranging from a master degree with honor in architecture and engineering to visual art workshops and residencies. 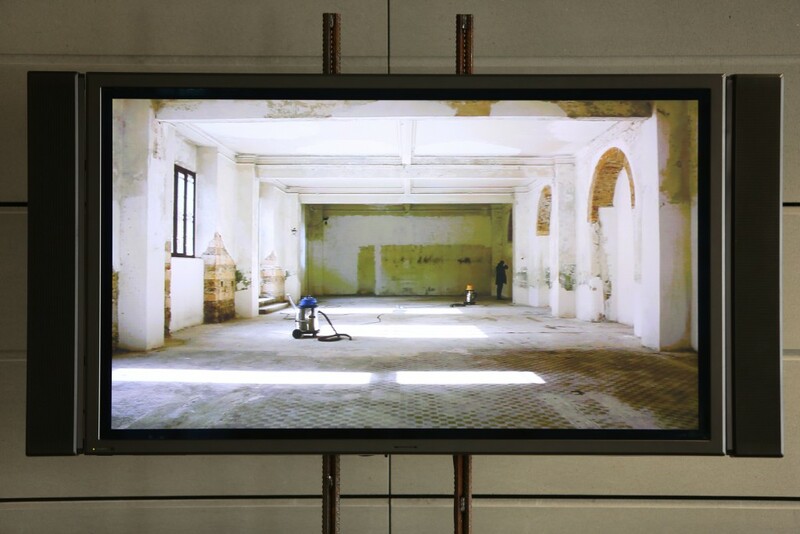 He makes use of diverse media from video to installation and performance. He collaborated with the studio of Architect/Artist David Adjaye and with the director Raoul Ruiz among others. In 2011, he was selected for the Italian Pavillion at the Venice Bienniale, in 2012 for Pixel – the new generation of Italian videoart. In 2014, he was awarded with the highest honor by the jury at the 24th Biennial of Design of Ljubljana, curated by Jan Boelen for the project BIO50}hotel within the section nanotourism. Since 2009, he has been collaborating also with Polish-German artist Shawnette Poe. As Fonte & Poe in 2012 they produced a performance for the MAXXI Foundation of Rome among the VIVA Performance Lab curated by Tania Bruguera and Cristiana Perrella. Their work has been exhibited in collective and personal exhibitions by institutions such as Dak’Art OFF, Chiostro del Bramante, Panoply Performance Lab New York. He lives and works between Italy and Slovenia.